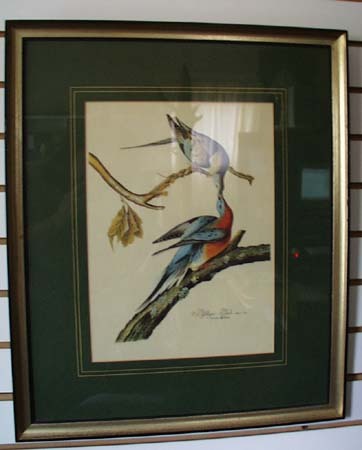 Passenger Pigeon Audubon print for Ethan Allen Fine Furniture stores. This is a Nature type scientific drawing of a male and female passenger pigeon done in the Audabon style (it is not marked as to who made the original drawing), and is probably from the 1960 era. It is a black with a goldish foil frame, very exquisite and professionally done. Ethan Allen Gold foil sticker is on the back side. Excellent condition. 19 1/2 x 24"" Picture doesn't do this justice, it is taken through the glass and the glare takes away from the beauty of it. 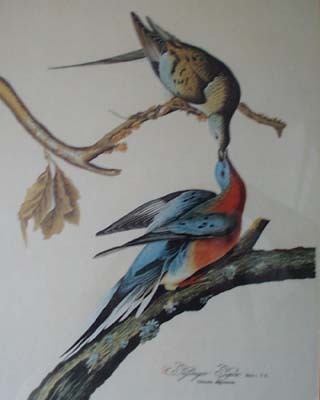 Items Similar To "Passenger Pigeon Audubon print for Ethan Allen"